Get folder names from folder. 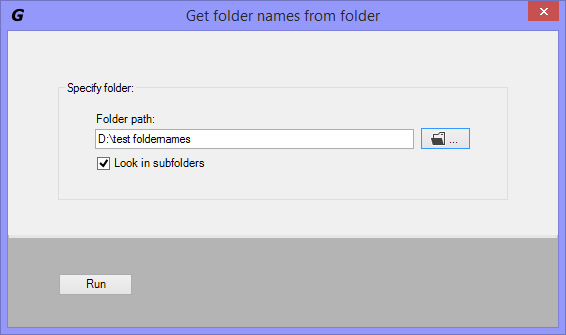 Get folder names from folder module will help you write folder names in Excel cells. One can write up to 1,048,575 folder names from the specific folder and/or subfolders into Excel cells. If there are more than Excel rows number limit (1,048,575) to export, then you are promped to save those folder names into a csv format. Also you can get extra information along with the folder name, such as full path folder name, number of subfolders, number of files, etc. After the installation you should see the GEGPRIFTI tab. 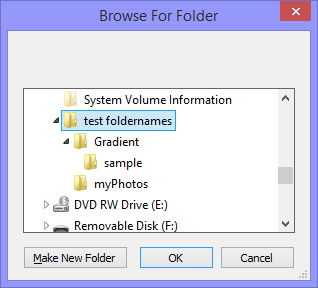 Clicking the "Get folder names from folder" button get the following dialog box opened. Specify the folder path from witch you want to get the folder names from. Tell the program to look for folder names in subfolders. Clicking the browse folder button will open the "browse for folder" dialog box. Select the folder to export folder names from and click OK. This window can be opened by clicking the triangle button at the bottom right side of the Folder & file names group in GEGPRIFTI ribbon. Get the full path folder name as clickable link inside Excel. This feature is turned off when you are exporting into a csv file. Get only the folder name where the folder is in. Example: test foldernames. Get only the folder name where the folder is in as clickable link inside Excel. Get the folder name. Example: myPhotos. Get the folder name as clickable link inside Excel. Get the date folder was created. Example: 2014-08-13 2:36:35 PM. Get the date folder last accessed time. Example: 2015-02-25 11:00:42 AM. Get the date folder last writen time. Example: 2014-08-13 2:36:36 PM. Get information if the folder is empty or not. True (folder is empty), False (folder is not empty). Get the number of folders inside the folder. Get the number of files inside the folder. Get the size in bytes of all files inside the folder. By default the settings dialog box shows each time the Run button is clicked. Uncheck will run without showing settings first. 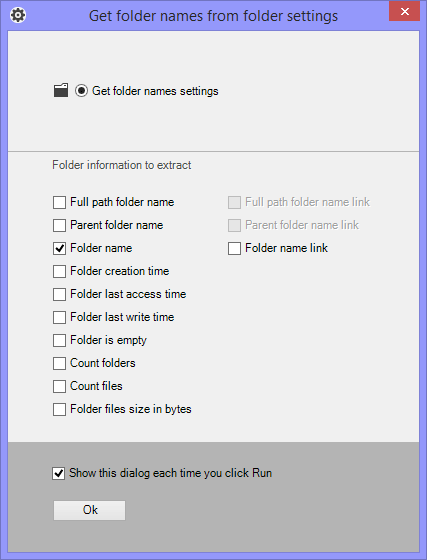 The settings dialog box can be opened by clicking the triangle button at the bottom right side of the Folder & file names group in GEGPRIFTI ribbon.